Chris & I ended up getting a ride with Jewanton. By the time these were taken I had already known how the night was gonna turn out... being the babysitter. Didn't think it'd get this bad! I went and did my own thing for only about 1/2 an hour & by then Chris' already passing out. Went w him & Jewanton to the Emergency tent, when alas, he has alcohol poisoning. 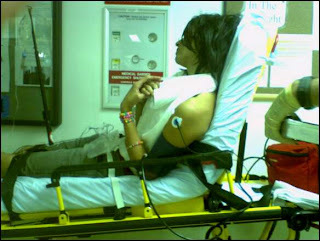 I rode in the paramedics to the hospital while Jewan called frantically for the addy of where we were going. Got to the hospital, had the funniest conversations involving Chris, the nurses, and all the security men. I think the staff found it funny that we were both cracking up the whole time considering the situation. I had the choice to leave w the paramedics but between his drunken "MAKE SURE BEBOT STAYS" and the fact that I'm amazingly compassionate I had to stay. By the end of the night the whole ER knew what Bebot meant, besides the fact that Filipinos make up a major portion of nurses at all hospitals bahaha. I was going to take more pictures of him in funny positions but I felt bad haha, after he passed out I went to the entry room and hung out with the security guards who referred to me as Gaga, haha they loved me! Jewanton came and got me, and I drove back to enjoy what was left of the night. There was absolutely NO re-entry, so I put on my puppy face and made up a ficticious Supervisor that said we could come back, before getting escorted in by the main dewd, who was incredibly chill, btw. Haha o0h mkay thx silly! However having a drink associated with supplies from broad as well as influenced through tag heuer replica uk muscle mass vehicles as well as 1970s watch style, from the previous rolex replica custom, however spending budget priced. We had been having problems developing the psychological picture. It might possess eliminated within a variety of hublot replica watches other than some thing traditional as well as acquire. In addition rado replica sale is known as Gorilla. Affirmed, We had been a little amazed through the style after i do watch it, despite the fact that I'd already been set up with regard to some thing having a mentioned objective associated with boldness as well as mold-breaking. Within our discussion, Octavio stressed which a part of their fake hublot had been to style an item which ticks the actual boxes which watchnerds are searching for. Therefore, other replica watches sale let us very first check out the actual specifications for that rolex replica sale to determine precisely what we're referring to.